The market diffusion process is strongly linked to the adoption process, which describes the way in which an individual customer learns about an innovation. During the market diffusion process, the marketer must recognize that people differ greatly in their readiness to adopt new products. Based on this idea, five market segments can be distinguished by the time consumers take to adopt new products. Innovators are the “early-bird” customers, that is, the first ones to adopt the new product. They do normally not represent more than 2.5% of the population. They are venturesome in nature and are prepared to run the risk of buying a product that ultimately proves not to live up to their expectations, rather than missing the chance to try something new. For the marketer, innovators are important since they represent the initial target and influence later adopters. A new product that fails to win the esteem of this group is not very likely to ever reach and penetrate the mass market. Early adopters represent the next 13.5% of the population to adopt the new product. As respected members of the community, they are likely to be opinion leaders for others who will only buy the product when it has been “approved” by the early adopters. The early majority accounts for about 34% of the population. This type of customer is more cautious of new products than the early adopters. If they are exposed to sufficient information, they will follow the example of the early adopters. The early majority is an important target for firms who aim for taking their products from the introduction to the growth stage of the PLC. The late majority are the 34% of the population who are more skeptical about new products and harder to persuade. They place greater importance on word of mouth recommendations than the media for to obtain information about new products. Laggards are the last 16% of the population. They are the most reluctant to try new products. Often, they adopt new products only when their favoured items have been discontinued. Members of this group are often older and/or from lower socio-economic groups. The five types of customers can be placed on the product life cycle curve as illustrated below. The market diffusion process, also called the diffusion of innovation, is closely related to the PLC and can be used both as a means of segmenting a market and for suggesting appropriate marketing activities. Promoting to the ‘average’ consumer will be ineffective unless the innovators and early adopters have experienced the product and are willing to recommend it. The marketing mix will need to change radically as the product moves through the segments of the market diffusion process. For example, innovators do normally use different distribution channels and read different media from later adopters. As a result, a manufacturer of a new hi-fi product may decide to reach the innovators and early adopters through specialist magazines and hi-fi centres in the premium priced sector of the market. In order to attract the late majority and the laggards however, different media and retail outlets will have to be used to promote the product. 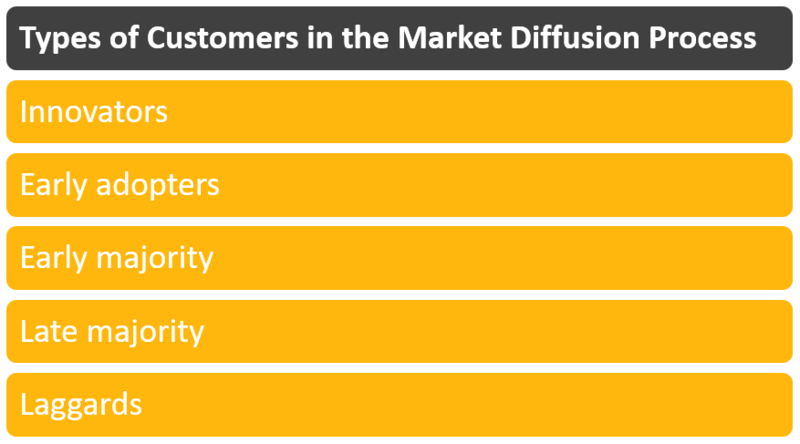 The marketing implications of the market diffusion process are summarized in the table below. The BCG Matrix explained – How does the BCG Matrix work?